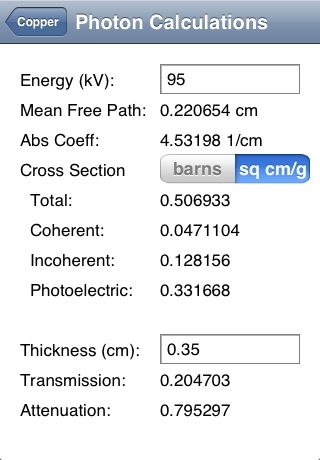 Photon Calc displays cross sections for gamma / x-ray photons, fluorescence and edge energies, and allows you to calculate the transmission and attenuation for an arbitrary photon energy. 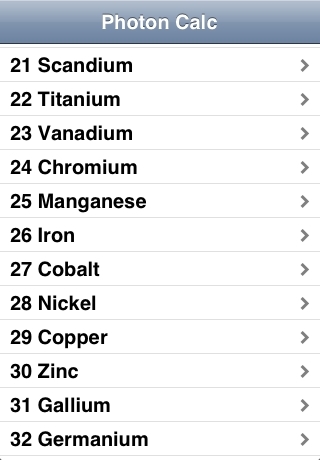 Information for 94 elements is available. 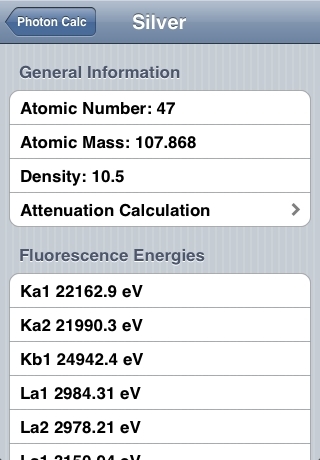 General information about the element is displayed, such as the atomic number and mass, density, and the fluorescence and edge energies (the number displayed depends on the element selected). Next you can enter in the thickness in cm, and the transmission and attenuation values (ranging from 0 to 1) will be calculated and displayed.